3 What is the Back-end? The aim of this document is to introduce the Back-end of a Joomla! site which is used by administrators for managing the whole site. It is useful to be familiar with this as background to creating a new web site. It is written on the assumption that you have not used this management tool but you have explored the content of a Joomla! site. If you solely enter and update content on a Site, you will not normally use the Back-end. The Back-end of a Joomla! site is used to manage the content, appearance and functionality of the site. It is not seen by visitors to the Front-end and you can only login to it if you have appropriate permissions. It is here too that the basis of a new site is created. Cross Reference: There is another document in this series that explore the Administrator roles - see Starting to manage a Joomla! site. If you can, it is useful to use a 'localhost' instance of Joomla! for exploring the Back-end because you can try things without doing any harm to an established site. Cross Reference: Another document in this series tells you how to download an instance of Joomla! on your own computer. Localhost installation on your own computer. An instance of Joomla! with the sample data is particularly valuable. Enter the address of the site that you are going to use. If you are using an established site - the address is the one for the Site itself (the Front-end) with the addition of /administrator. Logging out: This returns you to the Administrator login screen. Most sites log you out automatically if you have not done anything on the site for a defined length of time - usually about 15 minutes. This is for security. Click on the Logout link in the top-right corner of the Administrator screen. This shows the Control Panel of an established site. 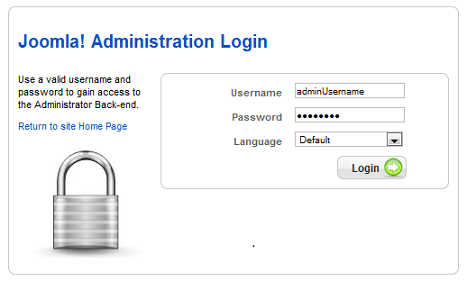 Here there are two visitors logged in to the site and note that the Super Administrator, logged in to the Administator page, has a username which does not include 'admin'. On many sites the administrators have usernames that do not indicate that they are administrators - for security reasons. This shows the Control Panel for the Sample data inlocalhost. Here all the options to the right (Site Information) are closed, although the 'Joomla! Welcome screen is set to display by default. This is almost the same as the other Control panel apart from some additional Site Information choices and illustrates that most Administrator pages appear much the same - which is reasonable because they all do much the same tasks. This provides administrators with a quick way to access the most frequently used tasks to manage the whole web site. Explore each of these to give you a sense of what an Administrator can do. The on-line Help for each one is comprehensive. 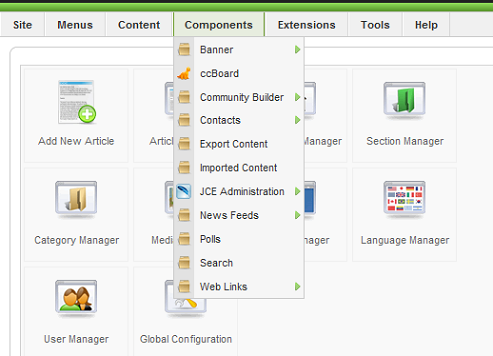 The Category Manager is where you can edit existing Categories and create new ones. 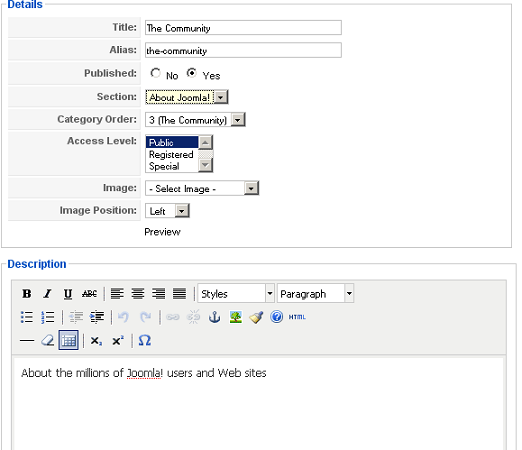 Articles in Joomla! are organized into Sections and Categories. Categories are the second level of organization underneath Sections. Every Section contains one or more Categories. The Media Manager is a tool for uploading or deleting files in the /images/ directory on your web server. You can upload new files, delete existing ones and create sub-directories. This allows you to look at a list of users and sort them in different ways. You can also edit and create users. All the various manager interfaces are similar and are designed to show key information and can be used for many tasks. A typical Management page. It shows a listing. Filter: this allows you to find something by typing in all or part of a name. Icons at the top: There are icons to allow various manipulations of content - such as Publish, Trash (ie delete) Edit and New. Help gives full information about the Article Manager. Click the icon to use the Help which is good and comprehensive. There are similar Help facilites in the menus of all the main Manager functions. Once you open a specific task in the Manager page, you are usually taken to a page with a Workspace layout. This can work in any site to which you hav e access - the examples use the localhost sample data. Editing a Category - a similar but blank one displays for adding a new one. The Workspace for a Category. The display here can vary according to how the site has been set up. Four display by default - as an earlier screen illustrates. The Site information for the Sample data in localhost shows that they give a very useful overview of the activity on the site. In the sample data there are also two addition ones (Welcome to Joomla! and Joomla! 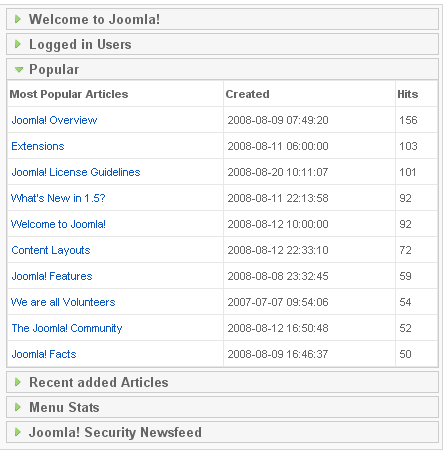 Security) which give information about Joomla! Welcome to Joomla! is open by default when the Administrator part of the site is accessed. These give access to all the functionality available in the site. The exact content of the Menus, and especially the Component Menu, depends on how the site has been set up. For example, this shows the basic menus under Components as they are on the Sample data. When you begin, you won't necessarily understand or remember it all. But pulling down the menus and seeing what is there shows you what more you will need to find out to progress. Help on-line: Help on all the Management pages has a link to the Joomla! documentation web site. In each Manager section Help gives comprehensive information about what all the features do. If you are an experienced reader of Help - this will not be too difficult and developers will welcome the added detail of the on-line Help. Beginners may find that they do not understand all the vocabulary. Persist - you will understand more of it as you get experience using a site which builds your understanding of concepts and associated vocabulary. Quick start guide This includes descriptions of the Back-end as part of installing and creating a Joomla! site. It is good and helpful. Learning Joomla! using Sample Data It has a short section on the Back-end but is also useful in exploring the Sample data in the localhost installation. This page was last modified on 29 April 2013, at 12:47.